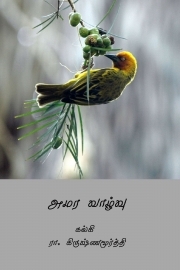 Description of "அமர வாழ்வு ( Amara Vazhvu ) (eBook)"
Amazra Vazhvu is a fiction novel written by Kalki R Krishnamurthy. Ramaswamy Aiyer Krishnamurthy (9 September 1899 – 5 December 1954), better known by his pen name Kalki, was a Tamil writer, journalist, poet, critic and Indian independence activist. He was named after "Kalki avatar", the tenth and last avatar of the Hindu God Vishnu. His writings include over 120 short stories, 10 novellas, 5 novels, 3 historical romances, editorial and political writings and hundreds of film and music reviews. Reviews of "அமர வாழ்வு ( Amara Vazhvu ) (eBook)"